Found these on one of my potted plants recently. Seen them around your yard or garden? These are good eggs, literally. Green lacewing larvae (Chrysoperla sp.) voraciously eat small insects all around them as soon as they hatch. One individual can eat as many as 200 aphids or other insects a week. 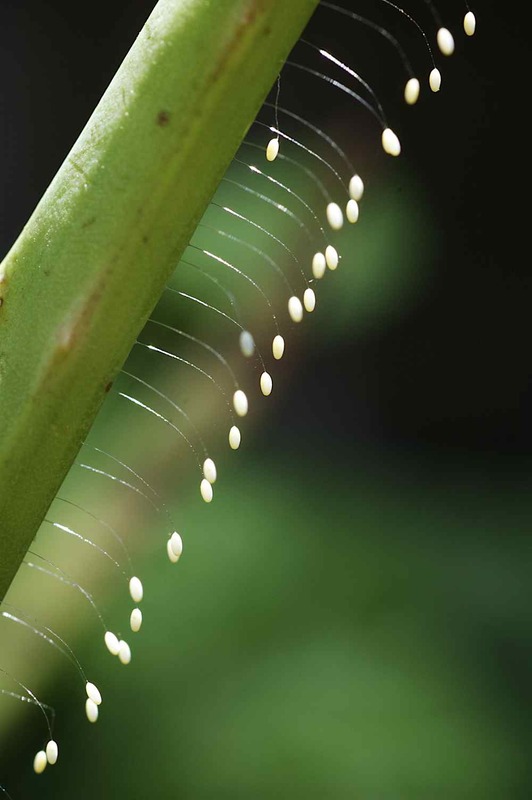 The stalks on the eggs help prevent the newly-hatched larvae from eating their siblings! I always wondered about that strange egg configuration. Who knew they eat their siblings. What a fun factoid! Ally, I think they are just voracious and indiscriminate eating-machines when they hatch. It’s interesting to me that a simpler solution to bug design here was to elevate the eggs on stalks than to build in mechanisms to prevent the ingestion of siblings.